So I’m a little late with this one, seeing as September is almost over already (how’d that happen? ), but September is national Hazelnut Month. I love hazelnut coffee, and hazelnut spread (especially on a warm crepe!) so naturally I love hazelnut cocktails as well. Here is a recipe using Hiram Walker Hazelnut Liqueur that is perfect for sipping on a nice fall day! Shake and strain all ingredients into a chilled martini glass. Happy National Hazelnut Month everyone and enjoy! The OTHER NY Football Team Cocktail! A couple weeks back now, Kayla wrote a great blog post to kick off the NFL season featuring a Hiram Walker Blue Curacao Margarita in support of her defending Super Bowl champion team, the New York Giants. And, since the G-Men are back on the field tonight in a Thursday night matchup (…which we’ve already discussed today. Like I said, Kayla’s a HUGE fan! ), I thought I’d try to cleverly swoop in and post a little football inspired cocktail of my own today. But this one’s in support of New York’s other football team, the New York Jets!! I’m a huge JETS fan! I’m always using my Jets beer mug on game day and have my hard helmet on standby as well (and, yes, I’ll wear it into a bar!). So when the task was placed before me to feature a Gang Green inspired cocktail – well, let’s just say the drink’s color was determinately not in question. That left me three choices from the Hiram Walker portfolio – their Melon Liqueur, Creme de Menthe and Sour Apple Schnapps. Add all ingredients to a shaker with ice. Shake, strain and serve in a martini glass. I invite you to give this recipe a try this upcoming Sunday for when the JETS hit the road to play the Dolphins in Miami. I would love as well to hear your favorite football-inspired recipes so please do leave us a comment below. Cheers to a great season and.. J-E-T-S! JETS! JETS! JETS! Time to ‘Whip Things Up!’ with Hiram Walker’s Newest Quest! 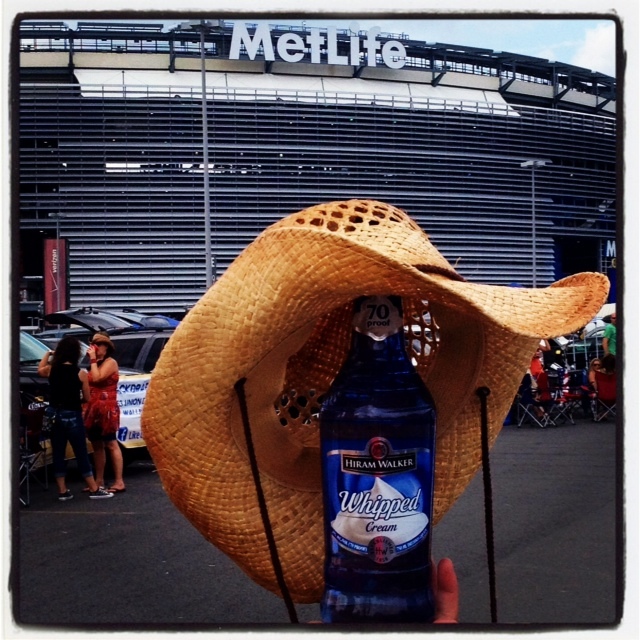 Whipped at the Meadowlands tailgating the Kenny Chesney Concert in August! It’s time again for another Hiram Walker Quest. This time, instead of a recipe contest, Hiram Walker is hosting a fun photo contest called “Whip Things Up!” with an iPad going to the winning submission! All you need to do is submit a photo that includes a bottle of Hiram Walker’s newest flavor, Hiram Walker Whipped, somewhere in the photo, the more creative the better! You can find out more details on Hiram Walker’s website www.HiramWalker.com or on their Facebook page http://www.facebook.com/HiramWalkerUSA under the “Whip Things up!” tab. In my attempt to embrace the fall instead of shunning it, today’s Friday Feature Cocktail is a Pumpkin Eater! Not the prettiest cocktail, but the taste of Hiram Walker Pumpkin Spice makes up for it! Fill glass with ice. Pour ingredients as listed. Garnish and serve. Go Big Blue: Blue Curacao Margarita! So now that September is upon us, and summer is sadly fading away, there is one thing I will admit that I love about September, and that is Football Season! As a big fan of the New York Giants I could not be more excited for 8:30 pm! Tonight I will put on my lucky Giants shirt for the first time since that glorious Sunday in February and I will drink booze out of my lucky Giants coffee mug (for those of you who don’t know me I’m just a little bit superstitious! )Now you may be wondering what I will be drinking out of said lucky Giants mug, but the truth is there is no lucky cocktail or beverage, so the contents of my mug have the flexibility to change frequently between coffee (rarely), beer, wine and cocktails. Tonight I will be mixing up a Blue Curacao Margarita as I cheer on Big Blue (adding blue food coloring to my beer did cross mind, but this seemed like a tastier option while it’s still warm outside)! Shake with ice. Strain into glass lucky giants mug. I wish you all a very happy football season, no matter who your team is!